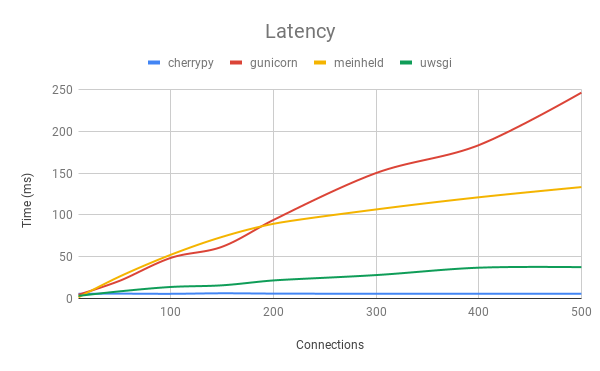 Prior to committing to a framework and a WSGI server we decided to test the following servers with no framework: cherrypy, gunicorn, meinheld, and uwsgi. The list of servers is short and was chosen based on current uses, documentation, stack overflow resources, and community size. Suggestions for other servers are welcomed. The servers ran on a Debian virtual machine with 2 CPU cores and 4 GB RAM. They were tested from another identical virtual machine using wrk, an HTTP benchmarking tool. The servers were tested with an increasing number of simultaneous connections, ranging from 10 to 500. Each test lasted 3 minutes and was repeated 3 times. The average of the results can be found in the graphs below. 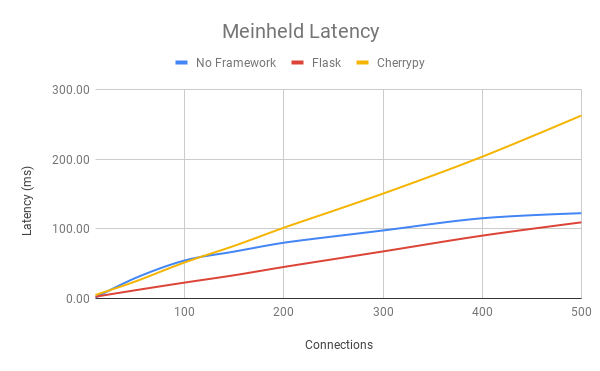 We chose to focus on the requests/second, latency, and errors. uwsgi errors were not included due to wrk misidentifying uwsgi responses as read errors. More information on the methodology and code base can be found in the repository. 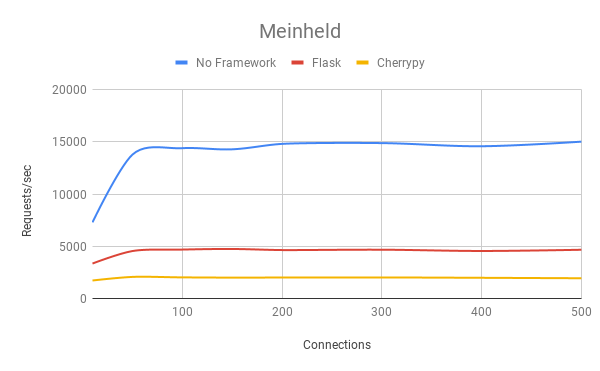 To better understand the performance costs of frameworks the tests above were rerun using the same environment but with two popular frameworks, Flask and Cherrypy. Suggestions for other frameworks are welcomed. 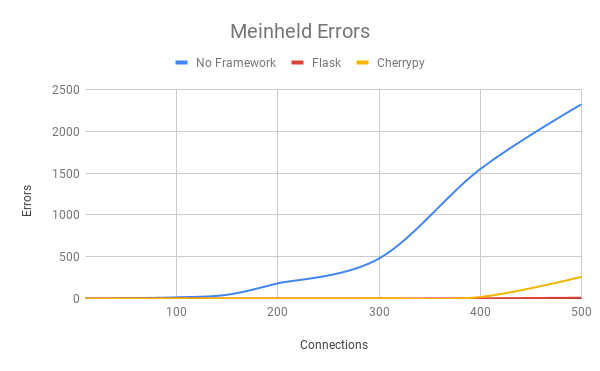 The graphs above compare meinheld’s requests/second, latency, and errors in Flask, Cherrypy, and without a framework. 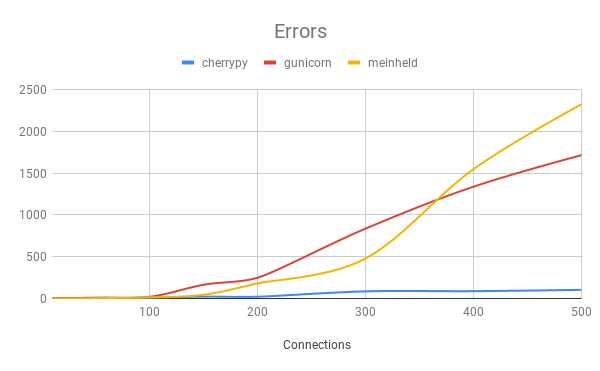 Results for the other servers can be found in the spreadsheet. wrk run from sessionstore1002.eqiad.wmnet (threads 8, concurrency 4096, duration 5 minutes). All requests were GETs of a single key with a value trivial in size. The throughput is quite good, I see no problems in this regard. 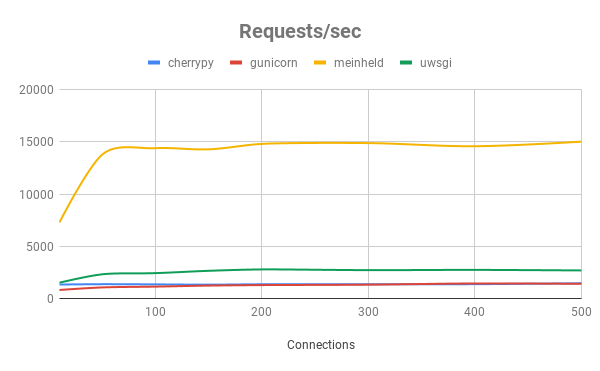 The distribution here indicates that about half of the requests fall between 25-50ms, and the other half (49.6%) are less than or equal to 5ms; 46.3% are less than or equal to 2.5%! 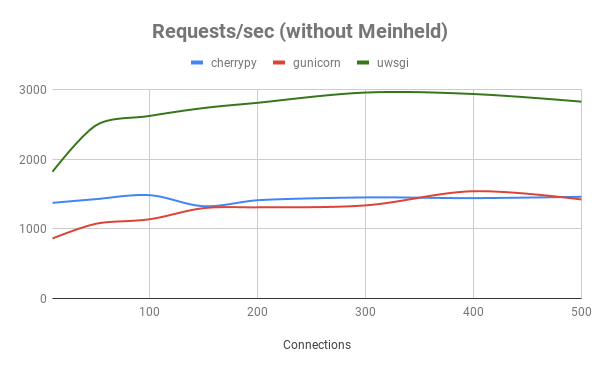 Taken together with the numbers from wrk, it would seem that roughly 1/2 of the requests are 37ms (+/-2ms), and ~1/2 that are 2.5ms (or less). Eevans closed this task as Resolved.